Rarely have I cried at a theatre performance, but I did at the end of Inherit The Whole, produced by Mortar Theatre Company, directed by Jason Boat. In my many years of involvement in the theatre, I rarely go to after-parties, but this one I did, so I could stand for the actors. 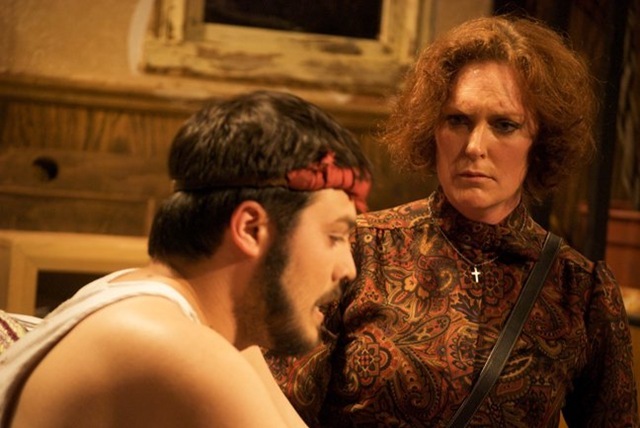 Inherit the Whole, written by Dana Lynn Formby, winner of the 2009 Kennedy Center National 10-Minute Playwriting Award, brings a complex, moving, and raw account of a Vietnam Veteran, Doug, played to exquisite intensity by Derek Garza. The role of Doug as strung out vet is no mean feat to play, and Garza carries this through until the end with a consistency that is staggering. Doug is a man with a mission to dig and dig until he finds the truth, a wild card, a man near mental collapse. Garza plays this with grit. He carries on until the end, putting his energy into the long haul. During the first act I was unsure the playwright would bring the characters to arc. The scene felt static and unresolved. But in the second act, the characters were collectively brought to such a high arc, I wept at the scene before me. This is rare writing, displaying impressive skill. The second act is so surprising in it’s follow through, it is more than worth sitting in a very warm theatre. This is the retelling of American history at it’s best. Lisa, played by Stephanie Stroud, is a tour de force. Beginning as the middle-of-nowhere mother figure, we see this woman take the stage by force of a gun. 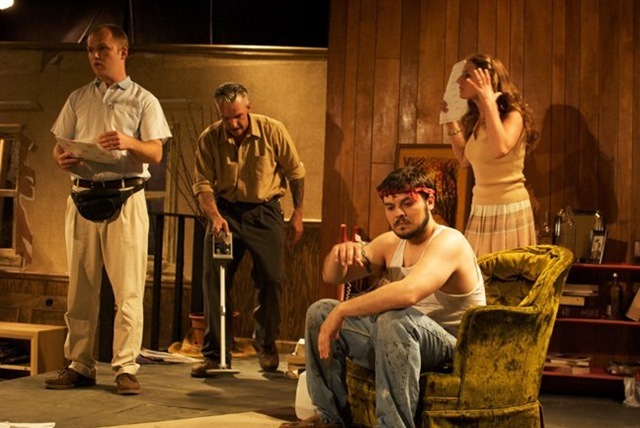 The use of guns in this play is powerful. I cannot remember ever seeing a play in which real guns were used as props. This is a story moved by violence and war, brought home, to a property under siege by greedy relatives. This is the story of a man who has served, and cannot escape his past. He refuses to let go, and we feel that pain every step of the way. Sarah Tode is the interfering Kalann, a woman given to a shallow and narrow view of the world. This is a beautiful actress willing to play the cad, and she does so without remorse nor bravado – a subtle performance, callous, and unapologetic. Paul, played by Christopher Jon Martin, is the stunning center of the piece. Imagine my surprise to learn he is just thirty-nine years old, while so convincingly playing the part of a man in his sixties. The patriarch of this unraveled family, Martin takes the stage with a force that is palpable. This actor represents the very magic that is theatre. In fact, he looked thinner when I met him after the show, than he looked on stage. That is called acting. The lighting, by Camden Peterson, is too hot for this piece, and does not display the nuance and movement necessary to make the play sing – for this show’s lighting, then, less definitely is more. This intense drama needs shade and the most careful touch. The lights were simply too crass and bright and at times distracted from the action. Music is non-existent. A soundtrack is needed here. There is much music from the sixties to use as a guidepost, and a more robust sound-design would add hugely to the impact of this piece. The scenic design by Eric Broadwater is outrageous. No detail is left out. It’s nearly guerilla theatre in the sense that it becomes a character in the play. There is no escaping this environment. From the dirt, to the papers, to every small imagining, this is scenic design at it’s best. Small lamps, paintings, shelves, chairs, every part of this design is flawless. Absolutely nothing is left untold, reminding me of a Hitchcock film. Mortar Theatre is the brainchild of Jacob Juntunen, Managing Director, and with this production of Inherit The Whole, he is bringing a striking new voice to theatre in Chicago. I got a chance to chat with him after the show, and he is direct, political only in the sense of history, and does not wish to bring confrontation, but release from our American landscape, our nightmares, our misery. This is solemn theatre; not for those who wish to leave the venue singing a song. This is theatre for those who want to leave the theatre changed and moved. Inherit The Whole will give that to you; dress lightly, and bring a cold beverage; you are in for a hot ride. 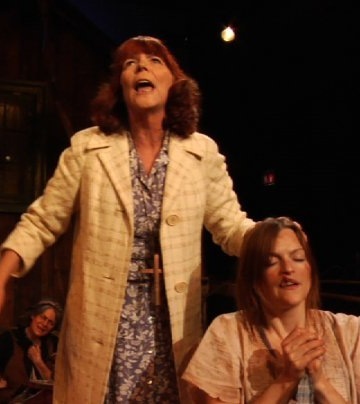 American Blues Theater’s production of Tobacco Road is like the very best kind of church. It’s the kind of experience that leaves one in a reverent state, even more aware of the plight of poverty in our nation as it still exists. The play is every bit as relevant today as it was when it was first presented in 1932. 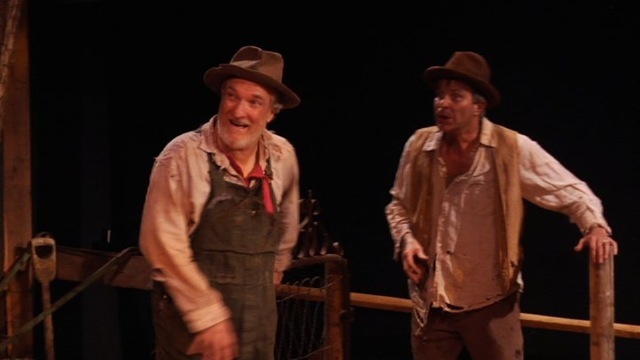 Written by Jack Kirkland, based on the novel “Tobacco Road,” by Erskine Caldwell, is a stark and real look at the farmer supplanted by industrialism and left literally to starve on his own land. At last I have seen a production of this play that stays true to the core of the novel, a very different take than John Ford’s 1941 film of the same name. The film was quite oddly played for laughs, and thankfully the production at American Blues Theater plays it for what it is: a moving and thorough description of poverty, ignorance, and superstition. During the first act, there was laughter from the audience, but the actors commanded, and by the end of the second act, the house was silent. The destruction of a family never fully realized was complete and there was nothing funny about it. 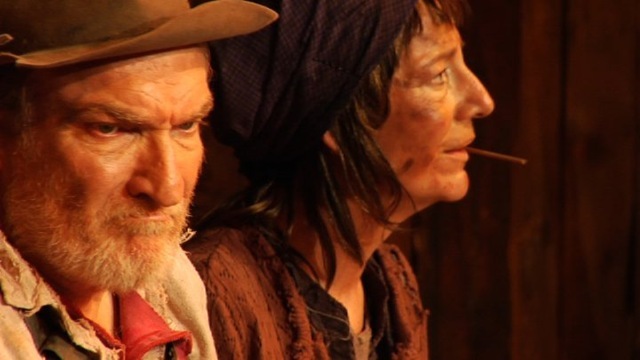 Directed with a strong and gentle hand by Cecilie Keenan, Tobacco Road shows us the unraveling of the white immigrant farmer through the magnifying glass of a modern world. Set in Georgia, lack of education and religious superstition are given center stage as we look at the near indigenous generation in the aftermath of the American industrial revolution. Keenan remains incredibly steady with a kind of driving force as she asks the question about the almost-indigenous whites in this country as to whether or not we can support them as they are. 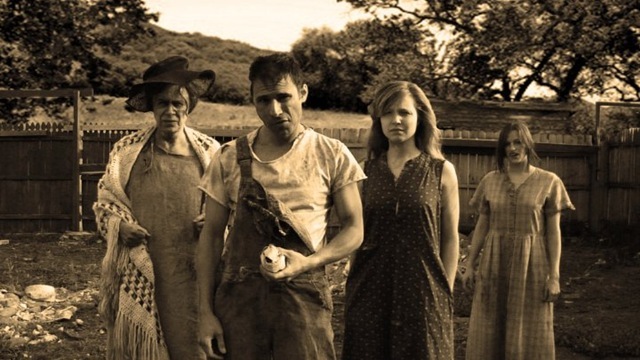 The director brings a fresh look at the immigrant, the white farmer, a new generation born here without choice, taking on the family farm without question. There is a sense of the tribal here that is clear; the bringing of cultural belief into a system of growing disregard for it’s heritage. Keenan lets us feel uncomfortable, and for a moment we laugh at ourselves, our own roots, and discover we are not very far removed from it’s origin. And then it gets serious. While, for reasons I cannot devise, this play is often thought funny, it simply isn’t. There is nothing ultimately humorous about starvation, bank seizures, or the kind of blind faith in religion that drives a family to ruin. However, it is only by this faith that the Lester family in Tobacco Road are diverted from crime. This is a deep and riveting idea that keeps these people on their land, without food, and unwilling to break the law to eat. 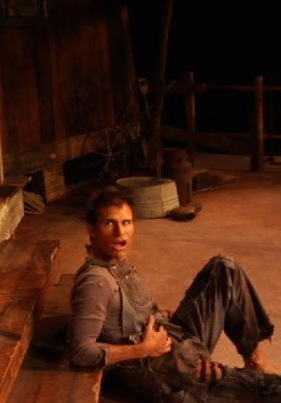 Jeeter Lester, patriarch of the Lester family, is played by Dennis Cockrum with a quickness and lightness, never giving over to the maudlin, carrying this piece with a smooth energy and pace. It is through this character that we find the horrifying desperate measures of the impoverished, and we watch as he takes his daughter Pearl, beautifully played by Laura Coover hostage, in a final attempt at salvation. Carmen Roman plays Ada, Jeeter’s wife, with the angry intensity of a woman who is starving, but clings to the very ideas that are coming through by way of industrialism. Her dress is faded and torn and she is worried she will be buried in rags, even while she longs for snuff to abate her hunger. Roman approaches this role with a hard flat consistency; a depiction of extreme hardship with humanity at it’s core. This is a woman who will protect young women from the men who bring harm. She sees how wrong these circumstance and conditions are and fights to her last breath to right them. Roman is a lion in this role. Dude Lester, played by Matthew Brumlow, is only sixteen years old in Erskine’s novel. While Lester played this role with an unexpected wisdom and depth along with a loony sort of aplomb, he is far older than a teen. This is important because he ends up married to Bessie, played with appropriate efficiency and without pathos, by Kate Buddeke, a Christian preacher of a kind, who is thirty-nine years old. It is here that Erskine brings us the starkest of realities in the deep South. Bessie announces that God has approved this marriage and a license is purchased, the poorest of nuptials offered. This is no love story, but one of gross predator upon child that the script doesn’t depict well. In the novel, Bessie has a pig’s nose; in looking at her, we are looking straight into her nostrils. The prosthetics by Steve Key, while admirable indeed, were not as fully realized as they could be. Even in a small house, they were not played out to the full extent needed to be effective. The work is very fine, but this is not film, and we do not have the benefit of close-ups. Ellie Mae Lester, played by Gwendolyn Whiteside, is the heart of this piece. Born with a harelip, she is the young woman longing, damaged, beset, starving, and without typical beauty, frightened by the prospect of life without a husband for survival. Whiteside brings and eerie illness to this role. She writhes and floats, her physical command is impressive. She sits behind flat eyes, staring at a world that hates her on sight and she mourns. I have rarely seen makeup so well done. Again, from Steve Key, the dirt, the squalor is incredibly smooth and believable. This is difficult to achieve, and the makeup is nearly a character in this piece, as it brings the very tone and color to a setting so necessary as to make this look into reality complete. Tobacco Road brings us poverty as it is in the United States. Under this unwavering direction, we never get to look away from it’s crush of human life and spirit. I have spent time in Georgia, and this misery is still in play, every bit as striking as it is presented in this piece. This is theatre that does not seek to entertain, but to motivate. The director is Georgia born, and with her insight we leave the theatre informed about unspeakable living conditions that we never talk about, rarely see, and have made little attempt to repair as a nation. Buy a ticket, take the ride. Cosmic road trip! Everyone climb into the beat up truck of the human condition for the drive everyone dreams of, but are too afraid to take. The drive wherein souls are lost and found, fate and choice crash – where you can go back and do it again, throwing yourself against the idea that you cannot change outcomes. Or that fate will have its way no matter what, so throw the dice, and make your own way. Buy the ticket, take the ride. Sun, Stand Thou Still, written by Steven Gridley, is a dreamlike adventure across timeless roads to places we’ve been. We visit the destinations made of real life nightmares, and those we consider to be the most joyous of human experiences. But, what if the sun stood still and we were caught in that singular place; one where love and life are synonymous with death? When the sun began moving again, would we make a different choice.? Take it all back? Do it all again because the moments of good we received were worth the pain we endured? On this road trip, with seven characters in search of internal freedom, the highway is rough and uncertain, sweet, and driven by struggle. In Sun, Stand Thou Still, these most essential of human events happen simultaneously in a time-order only the cosmos know. This is not linear time, nor time measured by a clock, but time as we know it flows through the spheres, and cannot fully comprehend. Ka-Tet Theatre’s production is full of energetic and committed performances that drive into this work and remain true to it. 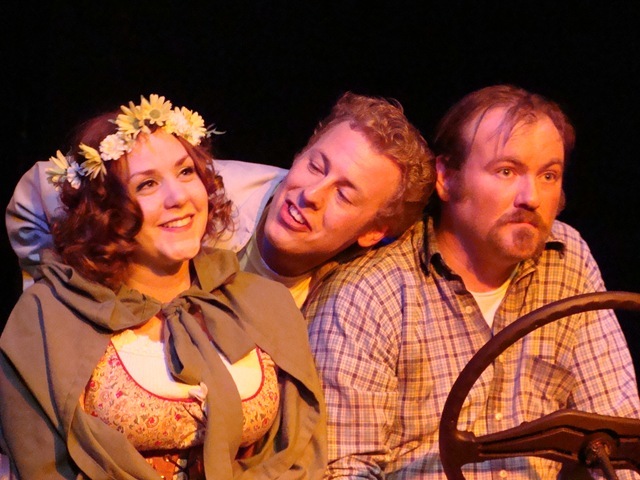 The play includes five characters: Officer Peters, The Driver, The Hitchhiker, The Apple Woman, and The Man. The use of kuroko, traditional to Kabuki Theatre as stage hands who move silently on the stage during the performance to manage set and prop changes, are always wonderful to see. Kevin Lambert and Kyle Youngblut perform these roles to perfection. A good kuroko brings a prayerful quality to a production and these two do just that. Jeremy Clark, as the Driver, elicits a fierce performance that stands as lead, even within such a close ensemble. This is an actor who is very at home in his skin. Zany, with compromised eyesight, The Driver pulls out every stop on what would be deemed appropriate on the ground, but on this ride, pushes every envelope right into true love and death and back again. Part Zen master and part madman, this character cries out to be fully realized in word and deed. Clark throws this role off the cuff with a magical deftness. He does not strive, but owns his performance. It has been awhile since I have seen an actor so in character that nothing breaks his focus. Emily Waecker designed the costumes for the play, and they are very important to this piece. From The Apple Woman to The Driver, The Man, and The Hitchhiker, the costumes convey the accident of time placement that has occurred. Is The Apple Woman a misplaced renaissance maiden, traveling this lone road in space and time? The Man, a crazed cowboy riding through from another period in search of his bride? The Hitchhiker, lost in the stars in the 1950’s, coming to earth now in this time and place? Meanwhile, the Driver is synonymous with everyman, you and me, dressed for the right now. The costume choices are gorgeous in their simplicity and daring. They stand on their own, making statements about context and providing grounding. Scenic designer Isabella Ng sets this scene, creating automobiles from suitcases, giving the beautifully strong visual command that we are all travelers, carrying what we have, even into collisions of will and destiny. The set theme carries the idea that one cannot escape their experiences, but bring them along for the ride, even into the place where one moment, one action, changes everything. Again, we are treated to an element from Kabuki Theatre, Hiki Dogu; set pieces designed to move the actors on and off the stage. This use of an 18th-century set conception gives the piece an added mystery and fluidity. David Fehr directed the production with a very loose hand. It’s difficult, when working with an ensemble that is so well connected, to know when to push and when to stand back. Unfortunately Fehr too often chose the latter, even in those places when his reign was needed to bring the piece into a swifter pace. There is depth and wisdom here that hasn’t entirely grown yet, but would flourish with the right director expanding creative boundaries and letting the ensemble thrive while keeping the fine art of control amongst an enormously talented cast. With a little stronger hand from a staid director, Sun, Stand Thou Still would surely swirl and fly around us gloriously. The script is, for the most part, exemplary, but given the deep concept of time it presents, more should have been brought from the writer himself. There is something that isn’t being said, but held onto, unexplored. I offer this in the spirit of passion for theatre and excellent work, which this is. In the linguistic sense, this piece left me longing for a greater depth of description of the emotional time and space we were a part of. Overall, the Ka-Tet Theatre Company, comprising the ensemble of Brian Hurst, Jeremy Clark, Dan Meisner, Kathryn Bartholomew, Mark Pracht, Kevin Lambert, and Kyle Youngblut, work incredibly well together, bringing a reverence to this piece that’s a joy to watch. Sun, Stand Thou Still strips away place and time and brings our most haunting, frightening, and magnificent human truths tumbling on top of one another. This piece has so much to offer in terms of bold new theater by Ka-Tet, a relatively new theatre ensemble, that it would be well worth your time to venture out to Lakeview to give the show a look-see. A provocative, timely ode to newts. Watching the truly gorgeous world premier of War With The Newts: Mr. Povondra’s Dream, written by Jason Loewith and Justin D.M. Palmer, one can’t but feel awed by the sheer creativity, expression, and professionalism displayed by the cast and crew of this bold undertaking. Produced by Next Theatre in partnership with Loyola University, full license has been given to create a space that is an incredible natural otherworld of form and function, with free reign from the director for actors to turn in performances from the soul. 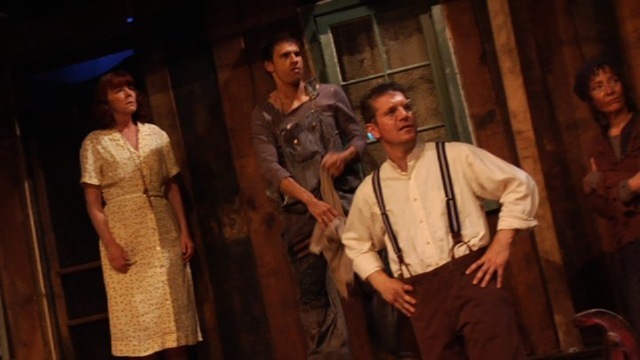 Based on Karel Capek’s raucous 1936 science fiction novel, “War With The Newts,” the playwrights go to lofty heights to capture such an immensely important work and bring it to the stage. While the script is lovely in the linguistic sense, and seeks to dig as deeply as Capek did into fascism, anti-Semitism, individualism versus collectivism, and the very nature of all economic systems gone awry, they quite unfortunately remain politically correct. This correctness does not serve to punctuate the play as Capek’s satire does in his seminal work. Capek draws verbal cartoons around anti-Semitic propaganda that are so big, there is no question as to the ridiculousness of its source. And under the cartoon, we get the glittering individual in a continual struggle to be free from the oppression of it. Conversely, Palmer and Loewith simply do not push this out far enough to hit the high Capek does. The Newts, giant salamanders, are a brilliant and hardworking new discovery who become enslaved and exploited by Czech industrialist, G.H. Bondy. The Newts gain human knowledge and rise up in a bid for global supremacy. It is in this essential theme that the script falls short again and away from Capek’s philosophy. One must understand Capek’s context and perhaps read his essay, Why I Am Not A Communist, to fully grasp The War With The Newts. He was not simply delving into the fight between the masses and the dictator, but getting at the very root of slavery; that it’s existence is due to the very idea of the masses at all. In Capek’s view, it was in the very concept of what we call the masses, that the truly egregious takes place. An eradication of the individual case in favor of a one size fits all mentality. And in this bonding between one very like another, where poverty and degradation occur, the desire to rise as one and become dictator always presents itself. It is in these deep considerations that the script doesn’t always find its voice (and to my mind, the only element that would stand in the way of this show running on Broadway). Capek looks at the root causes and conditions underlying warring factions, and seeks to break the never ending cycle of masses to rulers to masses again. The scenic design, by Collette Pollard, is a dreamscape of pure imagination partnered with a skill that is breathtaking. There is a stark simplicity coupled with the raw element of rain that culminates in a surreal movement of the set itself into a tilted version of reality, bringing intensity and breadth to this work. Puppet designer, Michael Montenegro is a full scope imagineer, creating and realizing the Newts so artfully, that one leans in with the delight of it. Mike Tutaj’s projections of headlines from the era, changing to reference Newts rather than the actual warring factions of World War II, are absolutely of the quality one sees in larger productions. Executed with style and humor, the projections tell the story through popular media, bearing every resemblance to the period, with a witty nod toward what we are given today by way of headlines. Lighting designer Keith Parham delivers a scheme in which locales are changed by light. The scenes at the ocean are lit so perfectly, so believably, they are transporting. Directed by Jason Loewith, the elements of the wildly imaginative set and players are brought finely and warmly together in a mosaic of color and focus. Interestingly, while finding the script lacking in the ways mentioned, Loewith gives full play to each and every individual in the show, bringing unique performances from the actors and relying heavily on the very special cast and crew he has to work with. There is nothing one size fits all about Loewith’s style. He shows great command in allowing full expression of the artist, while maintaining a cohesiveness that is impressive. The script does not undercut this in any way, but with a falling away from the masses versus power theme in favor of attention to the core of Capek’s own philosophy, this piece would be explosive. This is not an ensemble piece, and the actors are up to the challenge of strength in the unique, playing off one another to create an energy that is alive and present. Will Zahrn, as Mr. Bondy, the wealthy businessman with an idea of how he can exploit the Newts, dares to play this character unassumingly in the physical sense and with all the bravado of a captain of industry in the vocal sense. He is the wizard in Oz, the man behind the voice, unsure and quaking, afraid to stop what he is doing, and at the same time seemingly afraid to continue. At the intermission, Zahrn becomes Professor Frantisek Czerny, delivering a lecture entitled, Up The Ladder of Civilization. The placement of this during intermission is unfortunate as it continues into the play when it resumes. The noise in the theatre of breaking between acts made it difficult to hear what was a very clever and fun way to add historical overview to the themes at hand. Steve Pickering as Captain Van Toch, is the sad, protective, captain of the sea turned Mr. Van Dot, budding captain of industry. Pickering plays the Captain, who arrives one stormy night on the doorstep of Mr. Bondy, with all the pushed out maudlin quality required for the audience to realize he did show up at the man’s home one night to tell him of the Newts and their pearls. Feigning a love for the sea and her beauty with no agenda, all the while seeking to benefit himself from the Newts’ ability to produce from it, Pickering suspends our disbelief deftly. He does all the work necessary to bring the full realization that he is central to the exploitation at hand, by way of exploiting a Jew, Bondy. He first enters the scene, demeaning Bondy with anti-Semitic rhetoric, and Bondy accepts it, belittled. As Mr. Dot, Pickering takes center stage and we are left to look at the true villain, the once seemingly altruistic man of the ocean, now a true captain of enterprise in all his glory, dressed up, sure, the real thing coming like a train wreck on the backs of others out of nowhere. There were audible gasps from the audience at the revelation. Mr. Povondra, played by Joseph Wycoff, is Bondy’s butler, faithful to the point he becomes so enmeshed in the unfolding drama of the Newts that he devotes his every moment to writing their history. Wycoff goes from the staid and formal butler to the wild abandon of a man obsessed by grand scale political arenas with a smoothness that is flawless. He remains loyal to Bondy in the telling, blind to reality, believing that he is the one who brought what he views as a historically glowing moment together by answering the door that fateful night the captain arrived. Mr. Povondra loses his family and job over his devotion to the overwhelming political events playing out before him and, in the end, we see he survives, old, not broken, wiser, less obedient. Wycoff plays Povondra as aged without cliché, a natural evolution of a man’s passionate mind seized for a time by folly, never fully realized as individual. Jennifer Avery as Mrs. Povondra takes a star turn as the beset wife of a once reliable man gone politico. Avery plays this without victimization, a simple woman who loves her husband, and is willing to sacrifice luxury for his return from his madness. Avery carries the understanding of a woman in such circumstances to great depth, while still maintaining the veneer of a woman devoted to knitting. There is a moment in which Mrs. Povondra becomes chanteuse, singing to the Captain and Bondy, dressed to the nines, in a fantasy of wealth and power. Avery does this without breaking out into the unreal. She remains the humble woman with a secret longing to be adorned and adored. Joel Ewing as Frankie Povondra, young son of the Povondra’s, is quirky and light, bringing humor to this piece, and the naivete of a child to a world of corruption and greed, a confusing father, and an upset mother. Ewing is delightfully errant and precocious as the young Frankie, and smoothly and effortlessly soft and caring as the older Frankie. It is through this character that we get to the heart of the matter – that these grievous economic situation are the responsibility of all of us; that we have each played a part in the outcome. Eddie Bennett as Stanislaus, Mildred Langford as Marguerite, and James Anthony Zoccoli as Gunther, bring high energy and a crisp take to smaller roles throughout the play. These are each standout performances for their unique approach and follow through. War With The Newts is an important work, especially now. In this troubled world, to see Karel Capek stunningly delivered onto the stage is indeed a sight for sore eyes. That two young playwrights dare to take on Capek’s work and realize it in a truly individual sense, is the stuff of which theatre dreams are made. There are plays that require the delicacy of actors turned surgeons to give them breath. In the complex, People We Know, written by Robert Tenges, the doctors are in the house. First, you will be hit with the anesthesia of sarcastic and witty one liners, then they get down to the work of dismantling the empty social connection of three couples who live in a faded post-modern framework of loose traditional roles and well-rehearsed lines. The play opens a year after Paul, played by C. Sean Pierman, has been accused and convicted of sexually abusing a young student in his class. In a series of flashback scenes, Pierman plays the days leading up to Paul’s incarceration as carefully and exactly as a man about to cut into a human heart . He does a quiet slow shuffle of a dance when he decides to tell his friend Eric, played by Robert Koon, of his dilemma. Sliding between the incident as being nothing to worry about to the fear he is in serious trouble, Pierman never resorts to expectedly creepy signals or overt body language. He deftly and believably maintains a teacher dude and boyish Peter Pan-never-grew-up quality. He elicits sympathy, but not too heavily; this is subtlety to its very core. Robert Koon’s approach to Eric is bold, with a Teflon coating, masking an emptiness that is remarkable in its thoroughness. Eric is a narcissist of the first order, but not of the dramatically and emotionally overwrought variety we typically see. In the conversation in which Paul tells him he has been accused of molesting a child, Eric immediately refers to the child as a liar. He laughs at the situation heartily, and tells his friend they will discover by way of tests that the child is certainly lying and she and her family will owe Paul an apology. Koon hits this flat world of taking sides by way of strong language, without care for actual outcomes, perfectly. Alcohol, played by wine and beer, is a constant companion to all of the characters in this work. These are not raging drunks, but people who must have a glass of medication in their hands most all the time or the vapid existence they carefully tend might reveal itself as such. The play is shot through with moments of clarity. Fleeting, never lit on, but sipped quietly away into the gentle buzz of the status quo. Dianne, Paul’s wife, played by Amy Johnson, remains emotionally lost a year after her husband’s sentencing. The other couples have shunned her with silence, and are only just inviting her back into the fold at the beginning of the play. They had no idea what to do with her, about her, or for her, and so quietly erased her from their lives through lack of contact. Johnson provides the razor to this piece in brief moments, pinpointing the apathy, the recited lines, then resumes her own role as the wife who still loves her husband, stands by her man, however unattached to the idea she may feel. There is no fervor in this, but a longing that he will reveal himself to her emotionally, giving her a kind of salvation for her long suffering. Joshua, played by Andy Hager, is the would be earthy man who sees good in love and family. If not for the dead quiet force called support by his wife, he would be seemingly content and accepting of life as it is. Hager plays this with a keen sense of humor and an insight into the situation that no one around him seems to catch on to. Elizabeth Bagby, as his wife, Hannah, brings pathos to a woman who only need shift her attention to a different man with a better job to fulfill her own expectations and maintain her vision of what life should be like. Through tears, Hannah mourns her choice to leave Joshua for what she perceives as bigger and better things, but there is a steeliness to achieve that trumps love. Hagby brings all of this with a quiet intensity that is riveting. The root of this piece is Maddy, played by Kirsten D’Aurelio. Maddy is part childless earth mother, part old school socialite whose softness and understanding allow for this play of ultimately apathetic friends to swirl around her without real upheaval. She will take care of everyone, she can be counted on. Without her, this world would crumble, starting with her husband, Eric. She willingly pretends to be young women he knows to arouse him sexually as unabashedly and sweetly as if she has no real idea the cost to her emotionally. At times she seeks freedom, but slips back into her roots – that of matron without true motherhood; mothering a man child who still wants to have a baby even after she has had several miscarriages. D’Aurelio plays this without any of the clichés of the enabler. This is a unique performance of unwavering strength; one that includes burgeoning homosexuality, all offered without guile. In People We Know, the audience gets to know the characters quite well. Within the play, they stand separate from each other only brushing by at arms length. Could any of these outwardly appearing friends have known Paul was molesting a child? No, because the structure of their lives, the agreed upon language, the self absorption, doesn’t allow for it. Only Paul’s wife, Dianne, has a hint from a memory of their wedding night. Sitting there in her perfect white dress, with her perfect new husband, sipping champagne, doubt crosses her face as he tells her a story about his childhood. She smiles the wistful smile of an already weary performer and shrugs it away, going on to build her perfect glass house. Directed with quiet and steady pressure by Adam Webster, People We Know does not seek to flay and enrage, soothe or heal. It only seeks to impress that we don’t know who we don’t know by careful orchestration of ourselves and the people around us. We play our roles well, choose others who play their roles well, perpetuating damage by a refusal to live truthfully with ourselves and the people around us. It is within this framework that navels are gazed at while children are hurt, growing up to play those same roles in a never ending show of polite and potentially soul killing company.